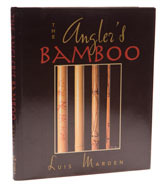 This is one of those books where I am going to exercise my reviewer's prerogrative of changing my mind - when I first reviewed it, I thought The Angler's Bamboo was a missed opportunity, but since then I have referred to it so often that I owe the author a debt of gratitude. It is true that this one could have been a classic which traced bamboo culms from the rain-drenched hills of Kwangtung Province in south-eastern China to the finished rod glittering on the racks of a smart tackle shop, but that wasn't how it was written and The Angler's Bamboo is the best reference work I know on the subject. All the same - can you imagine the personalities you would come across, can you imagine the complex motives of the many people dealing with and profiting from this extraordinary grass? Maybe I liked the Panama Hat Trail too much. What you get is 35 very nicely designed pages split roughly equally between the history of the split-cane rod, and the quest to find the finest bamboo the world has to offer, 24 pages of colour photos, and various scientific papers make a total of 88 pages. This book is for serious cane nuts, but I can't think of a better reference.